Copyright: © 2016 Hill K, et al. This is an open-access article distributed under the terms of the Creative Commons Attribution License, which permits unrestricted use, distribution, and reproduction in any medium, provided the original author and source are credited. Drive-thru users at fast food restaurants stay in their vehicle and have the engine running instead of walking into the restaurant to place an order for food or beverage. Although the drive-thrus are convenient, and they save time for costumers, they may have negative impacts on the air quality. Idling vehicles waiting in lines at drive-thru facilities waste gas, harm air quality, and increase greenhouse gas emissions. This study examined the emission rates at three fast food restaurants in Houston, TX, with different drive-thru configurations. By driving on each drive-thru facility in two different times of the day (peak hours and non-peak hours), instantaneous speed and acceleration of vehicles were collected on a second-by-second basis using Global Positioning System (GPS) devices. Then, for each second-bysecond data, Vehicle Specific Power (VSP) value was calculated using instantaneous speed and acceleration. VSP and instantaneous speeds of the vehicles were used to obtain the operating mode distribution bins according to the standard provided by the Motor Vehicle Emission Simulator (MOVES). The vehicle emissions were calculated based on the operating mode binning approach. Emission factors analyzed in this study are Carbon Monoxide (CO), Carbon Dioxide (CO2), Oxides of Nitrogen (NOx), and Hydrocarbons (HC). The results of the study showed that the estimated emission is lower at drive-thru facilities with fewer stops and number of lanes. With the fast food restaurant business consistently growing, it causes more and more people to use the drive-thru facilities, especially in the big cities where time and convenience are major factors in the daily activities of people. The drive-thru facilities have increasingly become an integral part of not only the fast food restaurants, but also the other businesses such as banks, DVD rentals, ATMs, coffee shops, pharmacies, and dry cleaners. In general, drive-thru windows are very popular convenience for those people who drive. Although drive-thrus are convenient, and they save time for customers; they may have negative impacts on the air quality. In this study, three fast food restaurants in Houston, TX, with different drive-thru configurations will be examined, and the total emissions associated with their drivethru facilities will be estimated. Most of the people living in major cities prefer to use the quickest and easiest way when it comes to ordering their food at fast food restaurants. Drive-thru shopping has become a part of their daily routine where their vehicles are kept idling during the service period. No matter whether there are lines inside of the restaurant and how many vehicles are waiting in the drive-thru line, drivers never step out their vehicle to make an order insider of the restaurant. However, such an idling behavior may result in enormous health and environmental consequence. A significant number of byproducts of burning fossil fuel may be produced during idling, which include carbon dioxide (CO2), carbon monoxide (CO), oxides of nitrogen (NOx), and Volatile Organic Compounds (VOC). While CO2 as a greenhouse gas contributes the most to global warning , CO, NOx and VOC are toxic exhaust gases for humans. Further, NOx can react with VOC and still air under sunlight to form toxic smog. Meanwhile, NOx is associated with the formation of acid rain. The concentration of the four byproducts in the exhaust gases is highly subject to many factors, such as vehicle operation , pavement types and roughness, engine efficiency, and roadway design [3,4]. For example, CO concentration in the exhaust gases is the highest during an idling phase with 69, 000 ppm from a gasoline engine . Vehicle emissions could be reduced at traffic conflicting areas, such as work zones [6,7], and signalized intersections in fog , where are equipped with Vehicle to Infrastructure (V2I) to improve drivers’ driving behaviors . According to a published statistics in 2010, “drive-thru sales account for more than 60% of McDonald’s overall revenues. Burger King relies on drive-thrus for 62% of its revenues. For Wendy’s, the number is about 60%. Starbucks doesn’t break out drive-thru revenues, but the chain operates approximately 2,650 drive-thru locations, representing approximately 35% of company-operated stores in the USA and Canada combined” . This statistics reveals there is a high proportion of population nationwide using the drive-thru facilities daily. It seems that drivers’ convenience has been trading off by air quality and public health. Some local governments have adopted policies in this issue and launched anti-idling campaigns to help educate people about negative impacts of idling on the environment. Furthermore, there are growing debates about the environmental impact of drive-thrus [11-15] and a few governmental agencies have been trying to eliminate and ban drivethrus. The USA Federal Highway Administration (FHWA) recommends turning off the vehicle engines in drive-thrus to reduce emissions and climate change . However, most people do not know that a vehicle that is idle at a drive-through facility and wait for a long period of time produces a considerable amount of emission. The USA Environmental Protection Agency (EPA) presented tables including idle emission factors for volatile organic compounds (VOC), carbon monoxide (CO), and oxides of nitrogen (NOx) for both summer and winter conditions . Idle emissions for particulate matter (PM10) were also provided for heavy-duty diesel vehicles only since it was negligible for gasoline fueled vehicles. EPA suggested use of the idle emission factors to obtain first-order approximations of emissions under idle conditions. There are few studies on the estimation of emission at drive-thru facilities. A group of college students in Pennsylvania calculated the vehicle emissions at two fast food restaurants by counting the vehicles and using an equation provided by EPA office of mobile sources . Mittingly et al. developed a methodology for estimating benefits associated with drive-thru restrictions by characterizing a drive-thru as an M/M/1 queuing system, and calculated the reduction in NOx emissions . As having been noticed, drive-thru facilities at fast food restaurants are built differently in terms of their configurations (number of stops, number of lanes, etc. ); however they all serve the same purpose. This study will examine the emission rates at three fast food restaurants in Houston, TX, with different drive-thru configurations. grade (%) is the vehicle vertical rise divided by slope length. VSP-based emission modeling approaches have been used to quantify a vehicle’s emissions during its regular operations [24-26]. The basic methodology for this modeling approach is binning second-by-second VSP data and computing the average emission rate in each bin. The meaning of each bin is the percentage of corresponding VSP values in the whole distribution. With this partition, the average emission rate of a particular type of pollutant in that bin for a specific vehicle can be calculated. The accuracy of the VSP-based modeling approach relies on how VSP bins are defined. There has been no clear definition about criteria in selecting VSP cutting points. However, since Motor Vehicle Emission Simulator (MOVES) is currently considered the standard tool that the USA Environmental Protection Agency has for estimating greenhouse gas (GHG) emissions from transportation sector, the definition of VSP bins provided by MOVES is used in the binning process in this study. Operating mode bins are a categorization method that describes vehicle behaviors based on the instantaneous speed and VSP characteristics, which serves the primary tool when generating total emissions [27,28]. Table 1 illustrates details of the operating mode binning provided by MOVES. In the table, the Operating Mode ID refers to operating mode bins that represent braking, idling, and varying levels of the vehicle’s VSP and speed. The operating mode bins are broken down into 23 bins that range from 0 to 40. As shown in the table, bins 0 and 1 represent braking and idling. Bins 11 to 16 represent driving behavior with lower speeds. Bins 21 to 30 represents driving behavior between 25 mph to 50 mph. Bins 33 to 40 represents driving behavior with speed 50 mph and greater. Table 1: Definition of MOVES operating mode characteristics . In this study, VSP values will be calculated using instantaneous speed and acceleration data collected by GPS devices. Once VSP is determined, the data can be categorized using the operating mode binning approach. Then, the vehicle emissions can be calculated based on the operating mode binning approach. Tao and Yu  conducted a research study and determined the emission rates in each operating mode bin using the real emission data of a light-duty vehicle collected by a Portable Emission Measurement System (PEMS). 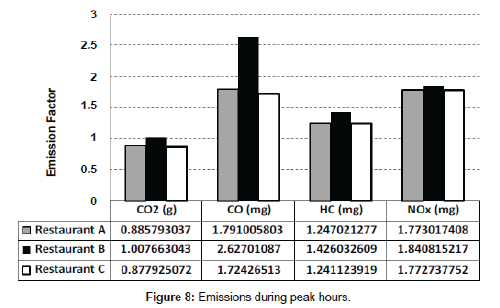 Those emission rates are shown in Table 2. Therefore, the total emissions can be calculated by combining the emission rates in Table 2 and the operating mode bins. Emission factors analyzed in this study are Carbon Monoxide (CO), Carbon Dioxide (CO2), Oxides of Nitrogen (NOx), and Hydrocarbons (HC). Table 2: Emissions rates of operating mode bins collected with PEMS . The data collection was conducted at each restaurant during the peak hours and non-peak hours. The location of the restaurants was important since the facilities should have been quite busy during the peak hours compared with non-peak hours. The first restaurant (Restaurant A) was located in a residential neighborhood, next to a large shopping center. The second restaurant (Restaurant B) was located in the area close to Texas Medical Center. The third restaurant (Restaurant C) was located close to two university campuses: Texas Southern University and University of Houston. Before starting the data collection, each location was visited at different times of the day in order to determine the exact time for both peak hour and non-peak hour data collection. Finally, two time periods were selected: 11:00 a.m. to 1:00 p.m. as peak hours, and 2:30 p.m. to 4:30 p.m. as non-peak hours. For each restaurant, one graduate student with more than three years of driving experience was assigned to collect data during both peak hours and non-peak hours by driving his/her lightduty vehicle in the restaurant drive-thru. The fuel type for the vehicles was gasoline. In total, three drivers participated in data collection. The speed and acceleration were collected while driving in the drive-thru facilities using the portable Global Positioning System (GPS) devices (Figure 1). This data collection approach recorded second-by-second real-world driving behaviors. The drivers were advised to turn on the GPS device when they pulled into the driveway of the restaurants. They placed their order and continue driving through the drive-thrus like a regular costumer. The GPS devices were turned off after they pulled out of the drive-thru. 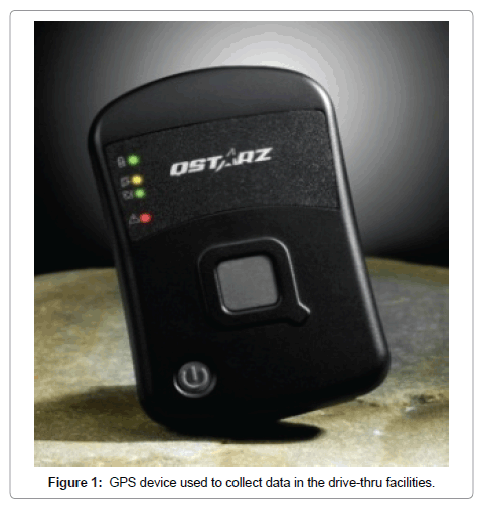 Figure 1: GPS device used to collect data in the drive-thru facilities. Each location had a different drive-thru configuration. The drivethru at Restaurant A included two lanes with two stops. The first stop was at ordering station where the menu board was located between the lanes; and the vehicles could stop at this point and order their food. Then those two lanes eventually merge into one single lane where the customers could pay and pick up their order at the same window (Figure 2). Since the drive-thru was not very busy in the afternoon between 2:30 p.m. and 4:30 p.m., the right lane was closed during non-peak hours. Drive-thru configuration at Restaurant B was much more different compared to Restaurant A. This facility had one lane with three stops. The first stop was to place the order, second stop was at the payment window where customers paid for their purchase, and the third stop was to pick up their food or beverage at the pick-up window (Figure 3). Figure 2: Drive-thru at Restaurant A: (a) the menu board (ordering station) located between two lines of vehicles, (b) the vehicles merging into one lane towards the pick-up window. Figure 3: Drive-thru at Restaurant B: (a) the menu board (ordering station) with one lane vehicles, (b) payment and pick-up windows. Table 3: Traffic count at drive-thru facilities during both peak and non-peak hours. Figure 4: Drive-thru at Restaurant C: the menu board (ordering station) with one lane vehicles, and the window for payment and picking up the orders. Step 1: GPS data from the vehicles were used to calculate VSP for each second of data recorded using Equation (2). Step 2: VSP and instantaneous speeds of the vehicles were used to obtain the operating mode distribution bins according to the standard in MOVES (Table 1). Step 3: The operating mode bins were combined with the emission rates provided in Table 2, and the total emissions are estimated. The goal of this study was to analyze the effects of drive-thru facilities at fast food restaurants on emission outputs of light-duty vehicles. Real world GPS data was collected for three restaurants with different drivethru configurations during peak hours and non-peak hours. The emission factors estimated were carbon dioxide (CO2), carbon monoxide (CO), oxides of nitrogen (NOx), and hydrocarbons (HC). Figure 5 shows the operating mode distributions for the vehicles using the drive-thru facilities during non-peak hours (2:30 p.m. to 4:30 p.m.). As seen in the figure, Restaurant A has higher frequencies in bins 11 and 12. These bins are described as low speed coasting and cruise/acceleration, respectively. However, it has lower frequency in bin 1 compared to the other two locations, that is idling. Figure 6 shows the emission factors for each light-duty vehicle using the drive-thru facilities during non-peak hours. During this time, Restaurant A had the highest emission factors except for NOx. As mentioned above, the operating mode bins 11 and 12 of Restaurant A had higher frequencies, which could be the reason that the total emission for Restaurant A is higher than the other two restaurants (the emission rates of the operating mode bins 11 and 12 in Table 2 are higher than bin 1). Restaurant C has the lowest frequency in bin 12 but the highest in 1 indicating there were more idling during non-peak hours. Restaurant B in bin 12 is the second highest and it also the second highest for total emissions (except for NOx). Figure 7 displays the frequencies of the operating mode bins for the vehicles using the drive-thru facilities during peak hours (11:00 a.m. to 1:00 p.m.). The frequency of the operating mode bin 1 (idling mode) for Restaurant A during peak hours is higher (74%) compared with the frequency of the bin 1 during non-peak hours (85%). That was because both lanes of the drive-thru facility at Restaurant A was open at non-peak hours, and two lanes had to merge into one single lane. In other words, the vehicles had to be idle for longer time. During the peak hours Restaurant B had the lowest idling time (bin 1), but higher frequencies in bin 11 and 12 compared with the other two locations (Figure 6). Furthermore, the drive-thru at Restaurant B has the highest emissions for all the emission factors. The reason is the drive-thru facility at this location has three stops (Figure 8). Figure 5: Operating mode distributions during non-peak hours. Figure 6: Emissions during non-peak hours. Figure 7: Operating mode distributions during peak hours. Figure 8: Emissions during peak hours. This study examined the emission rates at three fast food restaurants in Houston, TX, with different drive-thru configurations. By driving on each drive-thru facility in two different times of the day (peak hours and non-peak hours), instantaneous speed and acceleration of vehicles were collected on a second-by-second basis using Global Positioning System (GPS) devices. Then, for each second-by-second data, VSP value was calculated using instantaneous speed and acceleration. VSP and instantaneous speeds of the vehicles were used to obtain the operating mode distribution bins according to the standard provided by the MOVES. The vehicle emissions were calculated based on the operating mode binning approach. Also, traffic count was conducted at each location. Traffic count indicated that more vehicles used the drive-thru facilities during peak-hours. Emission factors analyzed in this study are Carbon Monoxide (CO), Carbon Dioxide (CO2), Oxides of Nitrogen (NOx), and Hydrocarbons (HC). The results of the estimated emission in this study may seem to be relatively small (since it is related to a single vehicle), but it adds up when it is multiplied by all the vehicles idling at that specific drive-thru restaurant. Furthermore, the results showed that the total emission for a single vehicle using a drive-thru facility is not only related to the idling situation, but the other modes (bins 11 and 12) also have impact on the overall emission. There are some other factors that must be taken into consideration when estimating the emission for a vehicle running in the facilities with the situation of idling and stop-and-go. One of the factors is number of the vehicles using the facility during that specific time period. This number not only has effect on the total emissions produced by all the vehicles, but it also has effect on the emission produced by that specific single vehicle. The reason is the average waiting time for each vehicle would be longer when there are more vehicles using the facilities. Therefore, it is very important to conduct the traffic count in these types of facilities. Restaurant A location had the most traffic during peak and nonpeak hours. The emissions were higher at this facility during non-peak hours versus peak hours. The reason was one of the lanes in the drivethru facility was closed during non-peak hours, however the number of the vehicles using the drive-thru between 2:30 p.m. and 4:30 p.m. was still high (Table 3). Due to this fact, the waiting time was increased, and vehicles emitted more pollutions. During the peak hours, Restaurant B had the highest emission rate, since the drive-thru facility had three stops. As stated earlier, vehicle idling produces more emission and with each vehicle stoping at each window it causes more idling time. The result of the study shows that Restaurant C seems to have the best drivethru configuration (one lane, two stops) since the related emission factors was the lowest during both non-peak hours and peak hours. At Restaurant C drive thru, there were not as many stops and lanes like Restaurants A and B. Therefore, there was less idling time for the vehicles. It seems that designing the restaurant drive-thrus with one lane and two stops may decrease of the vehicle emissions comparing to other design configurations. Li Q, Qiao F, Yu L (2016) Vehicle Emission Implications of Drivers Smart Advisory System for Traffic Operations in Work Zones. Journal of Air & Waste Management 5. 446-455. Li Q, Qiao F, Yu L (2015) Implications of Wireless Communication System for Traffic Operations on Vehicle Emissions. Proceedings of the 107th Air & Waste Management Association (AWMA), June 22-25, 2015. Raleigh, North Carolina, USA. Li Q, Qiao F, Yu L (2016) Calibrating Emission Factors for Highways Considering Pavement Roughness Information. Paper # 80. Proceedings of the 2016 Air Quality Measurement Methods and Technology. March 15-17, 2016, Chapel Hill, North Carolina. Busamra AA, Ghanem WS (2006) Quantificaiton of exhaust emissions from fleet vehicles at Dubai international airport. Reclaiming the desert: towards a sustainable environment in arid lands â�� Mohamed (ed.). ISBN 0415411289. Qiao F, Li Q, Yu L (2014) Testing Impacts of Work Zone X2V Communication System on Safety and Air Quality in Driving Simulator, Proceedings of the 21st ITS World Congress, Detroit, USA, September 7-11, 2014. Pp. TS64. Li Q, Qiao F, Wang X, Yu L (2013) Impacts of P2V Wireless Communication on Safety and Environment in Work Zones through Driving Simulator Tests (paper # 26-179). Proceedings of the 26th Annual Conference of the International Chinese. Munni J, Qiao F, Li Q, Yu L (2015) Driving Behavior and Emission Analysis at Yellow Interval with Advanced Warning Message under Foggy Weather Condition: A Simulator Test. Proceedings of the 56th Annual Transportation Research Forum in Atlanta, Georgia, USA. Li Q, Qiao F, Yu L (2015) Will Vehicle and Roadside Communications Reduce Emitted Air Pollution? Int J Sci Technol 5: 17-23. Rohrlich J (2010) Why drive-thru windows are crucial to fast food. Minyanville. Christopher C (2012) Santa Rosa's drive-thru dilemma: A city conflicted over need to serve community, protect the air. Cowie A. (2013) Donâ��t drive through (2013) About my planet. Kate G (2009) A Battle in Canada over drive-through idling. Green energy â�� the environment and the bottom line. Brail S (2008) Walk up instead of drive (2013). Federal Highway Administration (FHWA) (2009) 10 simple steps to reducing climate change (2009) Federal Highway Administration. Environmental Protection Agency (EPA) (1998) Emission Facts: Idling Vehicle Emissions. EPA420-F-98-014. Mattingly SP, Sattler ML, Bhatt H, Sumitsawan S, Palaen N et al. (2009) A model for estimating NOx emission reductions after closing drive-thrus. Proceedings of Transportation Research Board (TRB) 88th Annual Meeting. Jimenez-Palacios JL (1999) Understanding and quantifying motor vehicle emissions with vehicle specific power and TILDAS remote sensing. Ph.D. Dissertation, Massachusetts Institute of Technology, Cambridge, MA. U.S. Environmental Protection Agency (2012) Motor Vehicle Emission Simulator (MOVES), User Guide for MOVES 2010b, EPA-420-B-12-001b. Zhai H, Frey HC, Rouphail NM (2008) A vehicle-specific power approach to speed and facility specific emissions estimates for diesel transit buses. Environ Sci Technol 42: 7985â��7991. Lai J, Yu L, Song G, Guo P, Chen X (2013) Development of city-specific driving cycles for transit buses based on VSP distributions: Case of Beijing. J Transportation Eng 139: 749-757. Shi Q, Yu L (2011) Evaluation of mobile source greenhouse gas emissions for assessment of traffic management strategies. SWUTC/11/161142-1. Tao F, Shi Q, Yu L (2011) Evaluation of effectiveness of coordinated signal control on reducing vehicle emissions during peak hours vs. non-peak hours. Transportation Research Record 2233: 45-52. Li Q, Qiao F, Yu L (2016) Estimating Vehicle Idle Emissions Based on On-Board Diagnostic II Data. Paper # 70. Proceedings of the 2016 Air Quality Measurement Methods and Technology. March 15-17, 2016, Chapel Hill, North Carolina. Li Q, Qiao F, Yu L (2016) Modeling Texas Emission Factors Considering Pavement Roughness Using On-board Emission Measurement. Proceedings of the 109th Air & Waste Management Association (AWMA), June 20-23, 2016. Hyatt Regency, New Orleans, USA. Paper #: 1195. U.S. Environmental Protection Agency (2011) Development of emission rates for light-duty vehicles in the motor vehicle emissions simulator (MOVES2010), Final Report EPA-420-R-11-011. Li Q, Qiao F, Yu L (2016) Texas Specific Operating Mode Bin One Based on Field Test Data from PEMS. Proceedings of 109th Air & Waste Management Association (AWMA), June 20-23, 2016. Hyatt Regency, New Orleans, USA. Paper #: 1194. Tao F, Yu L (2012) Effects of driving behavior on vehicle emission: A case study in Houston, Texas. Proceedings of Transportation Research Board (TRB) 91st Annual Meeting. The work, in itself, is interesting and well written but few modifications will enhance the quality of the proposed research.